While having our brunch yesterday at Ah Lok Cafe, my good ol' friend, Cindy told me she went through some old photos the other day and had a big laugh about it. She scanned and forwarded one photo to me. My reaction was OMIGOD! That's the only word to describe it.The photo is sooo 90s. How time flies. The way we dressed, our hairstyles and not to mention our innocent faces. 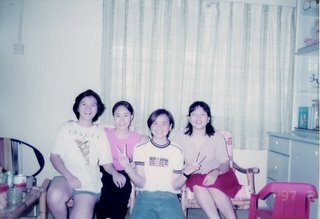 It was 1997 and together with Wai Loo, we were at Shu Fen's house to celebrate Chinese New Year. At that time we were still studying. Every semester or holiday break, we couldn't wait to go back to Kuantan to meet up with our good ol' friends whom we missed very much. What about the coming Chinese New Year? I think most of us will be just like the previous couple of years celebrating with our own families. We don't meet up for CNY celebration like we used to be anymore. Sad but it's true.